Mr. Steelman is a staff writer at the Cato Institute. 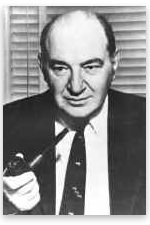 December 28, 1996, marks the thirtieth anniversary of the death of Frank Chodorov, one of the giants of the American Old Right. It seems appropriate to look back at his life and career, not only to pay homage, but also to rediscover some of the fundamental insights he brought to the fore in his many books, articles, and speeches. Born in New York City in 1887, Chodorov graduated from Columbia University in 1907, and spent the next 30 years working in a variety of jobs, including a stint as an advertising representative and running a clothing factory. From four to seven years was about all I could take of any occupation throughout my life. I went at each job I undertook with verve, mastered it and when it became routine I lost interest and went looking forsomething else, Chodorov wrote in his 1962 autobiography, Out of Step. Besides working in various fields, Chodorov read widely in the literature of liberty, and was particularly impressed by the work of Henry David Thoreau, Albert Jay Nock, and Henry George. By the time he was offered, and accepted, the directorship of the Henry George School of Social Science in 1937, he counted himself firmly within the classical liberal tradition. For the first time—at the age of 50—his position afforded him an opportunity to write and speak widely on the issues of the day and to spread the anti-statist gospel. He and his students started a school publication, The Freeman, borrowing the name from the then-defunct journal Nock had edited in the 1920s. In its pages Chodorov found his ultimate calling: journalism with an intensely personal, individualist flair. Chodorov pulled no punches in his many articles for The Freeman. He viewed the state as the greatest threat to individual liberty and human happiness. In the tradition of Cobden, Bright, and Nock, he did not limit his disdain for the use of state power to domestic actions; he feared the state’s ability to conscript its citizens and use them to wage war as much as, if not more than, he did its ability to control the economy. This intellectual consistency eventually gained Chodorov many devoted followers but, for the time being, it attracted some important opponents. In The Freeman I took delight in attacking the New Deal and Mr. Roosevelt, mainly on economic grounds. That went well until Mr. Roosevelt started preparing the country for war, in 1939. Prudence should have prompted me to avoid the war issue, but prudence was never one of my virtues, and I continued to hammer away at the war measures right up to Pearl Harbor. The school’s board regarded his principled and steadfast opposition to American involvement in the war as too controversial and too frightening to potential donors and, therefore, relieved Chodorov of his duties in 1942. Following his dismissal, Chodorov looked for a new medium for spreading his ideas. The result was his creation of analysis, which he later called the most gratifying venture of my life. An unpretentious four-page broadsheet published from 1944 to 1951, analysis was hard-hitting and uncompromising, just like The Freeman. Unlike The Freeman, however, analysis did not actively solicit articles from outside writers; nearly every issue was written entirely by Chodorov.
. . . analysis . . . stands for free trade, free land and the unrestricted employment of capital and labor. Its economics stem from Adam Smith and Henry George.
. . . analysis goes along with Albert Jay Nock in asserting that the State is our enemy, that its administrators and beneficiaries are a professional criminal class, and interprets events accordingly. It is radical, not reformist. In short, analysis looks at the current scene through the eyeglass of historic liberalism, unashamedly accepting the doctrine of natural rights, proclaims the dignity of the individual and denounces all forms of Statism as human slavery. In issue after issue of analysis, Chodorov kept the flame of the anti-statist, antiwar cause burning during some of classical liberalism’s darkest nights. He approached myriad topics from the same perspective: voluntary, peaceful actions are moral and productive and should be encouraged; coercive actions are immoral and should be condemned. As both an anti-statist committed to individual liberty as a great moral ideal and a social scientist examining past events objectively and empirically, Chodorov was a formidable and prescient critic. For example, in the 1940s Chodorov hit upon the ratchet effect theory to explain the growth of government, thereby setting the stage for some of the most incisive and probing work by classical liberals in the decades to come. In the August 1950 issue of analysis, he wrote: All wars come to an end, at least temporarily. But the authority acquired by the state hangs on; political power never abdicates. Note how the `emergency’ taxes of World War II have hardened into permanent fiscal policy. While a few of the more irritating war agencies were dropped, others were enlarged, under various pretexts, and the sum total is more intervention and more interveners than we suffered before 1939. When war or the need of ameliorating mass poverty strains the purse of the state to the limit, and further indirect impositions are impossible or threaten social unrest, the opposition must give way. The state never relinquishes entirely the prerogatives it acquires during an emergency, and so, after a series of wars and depressions direct taxation became a fixture of our fiscal policy, and those upon whom it falls must content themselves to whittling down the levies or trying to transfer them from shoulder to shoulder. On education, Chodorov was ahead of his time, developing a radical critique of government schooling long before the so-called school choice or voucher movement got on its feet many years later. To Chodorov, it was no surprise that students were receiving subpar educations at government schools. As he saw it, the purpose of the public school was not to educate children, but to turn them into good citizens—schooled in the ways of the democratic system and taught that they were the government despite the obvious absurdity of such a claim. By controlling the schools, the state could control, to a large degree, the minds of future generations, thereby limiting the possibility of dissent. In Chodorov’s mind, the only solution to the education problem was to separate schooling completely from politics: If we would reform our education system basically, we must desocialize it. We must put it back where it belongs, in the hands of parents. Theirs is the responsibility for the breeding of children, and theirs is the responsibility for the upbringing. The first error of public schooling is the shifting of this responsibility, the transformation of the children of men into wards of the state. Editing analysis brought great joy to Chodorov, but the journal was financially shaky. At its peak in 1951, it had no more than 4,000 subscribers. Edmund Opitz recalls that Chodorov was pouring so much of his own money into his enterprise that he was sustaining himself on one meal a day. In 1951 analysis was merged with Human Events, a Washington-based publication founded in 1944 by Felix Morley, Frank Hanighen, and Henry Regnery. Chodorov became an associate editor at Human Events and stayed there until 1954, when Leonard Read chose him to edit a revamped version of The Freeman, which Irvington Press (a subsidiary of FEE) had recently purchased. By the early 1950s, Chodorov was already well established as an individualist writer of the highest quality. In his view, the movement he had helped to preserve and shape in the 1940s was not conservative; it was individualist. He was disturbed by the growing influence of a system of thought he viewed as fundamentally majoritarian in nature. The new conservatism of Russell Kirk, Walter Berns, and Harry Jaffa did not in any way resemble the historic liberalism that Chodorov and other prominent Old Right figures held dear. This new strain of thought held that unbridled individualism, not an omnipotent federal state, posed the greatest threat to the social order. Moreover, Jaffa and company believed that the Soviet Union placed the United States in imminent danger and that decisive federal action was needed to thwart Soviet expansion. Over the next ten years, Chodorov spent as much time trying to check this new brand of conservatism as he did refuting the myths and dogmas of the Left. In Chodorov’s mind, only individuals themselves could, and should, make all relevant personal decisions. To rely on the vague notion of the community to make such decisions, as Kirk and others urged, was to subjugate the individual to the collective, and this subjugation was to be avoided at all costs. Chodorov’s unwavering defense of individualism and the minimal state also led to clashes with other American rightists regarding foreign policy. By the late 1950s, most conservatives agreed that noninterventionism no longer constituted a viable option; Soviet power was so immense and threatening that the United States needed to prosecute another expensive war, the Cold War. Chodorov balked. The Soviets, he argued, were a threat to the United States only if Americans allowed them to be. The real danger was not that the Soviet Union would conquer the United States militarily but that in the name of a strong national defense, the United States would take actions that would thoroughly collectivize the nation—this time, for good. Increasing the power of the state in response to the Soviet menace would not defeat socialism in Russia but bring it to the United States. For these reasons, he called the Cold War a war to communize America. In a brilliant essay on Isolationism, Chodorov once again stated his position for those who had ignored it the first time. He believed that isolationism was not only the type of foreign policy that kept the state to a manageable size, but also the one compatible with the makeup of human beings. It is in the nature of the human being to be interested first, in himself, and secondly, in his neighbors. To ask someone in Michigan, for example, to be interested in the affairs and political stability of Tennessee is slightly unreasonable; to ask that same person to be interested in the affairs of a far-off Latin American country is simply absurd. One flaw in their program was a tendency toward protectionism; the anti-involvement became identified with Buy American slogans and with high tariffs; that is, with economic, rather than political, isolationism. Economic isolationism—tariffs, quotas, embargoes and general governmental interference with international trade—is an irritant that can well lead to war, or political interventionism. To build a trade wall around a country is to invite reprisals, which in turn make for misunderstanding and mistrust. Besides, free trade carries with it an appreciation of the cultures of the trading countries, and a feeling of good will among the peoples engaged. Free trade is natural, protectionism is political. Chodorov also parted company with most of the conservative movement regarding big business. Unlike many of his colleagues, Chodorov did not hold a romantic view of corporate America; and he certainly did not agree with Ayn Rand’s belief that big business is America’s most persecuted minority. Instead he saw big business as all too willing to compromise with big government, producing a disastrous result for most Americans. In this way, he foreshadowed the arguments made by William Appleman Williams and Gabriel Kolko in the 1960s. Chodorov argued that in America it is the so-called capitalist who is to blame for the fulfillment of Marx’s prophecies. Beguiled by the state’s siren song of special privilege, the capitalists have abandoned capitalism. And to abandon capitalism was to abandon the very system necessary for the preservation of individual liberty and the attainment of human happiness. Despite Chodorov’s differences with many on the Right—and there were a number of significance—he maintained a position of prominence even after he left The Freeman in 1955. This was largely because of the Intercollegiate Society of Individualists (ISI), which he founded with Buckley in 1953 and continued to oversee until his death in 1966. ISI was the first large free-market organization to focus its efforts on influencing college students. Its goal was to be an effective antidote to the well-organized Intercollegiate Society of Socialists. It attempted to accomplish its mission by distributing free-market books and pamphlets to interested students, sponsoring classical liberal speakers on the campuses, and organizing discussion clubs. By the early 1960s, more than 40,000 students had taken part in its programs. ISI was an important part of Chodorov’s strategic program for turning back the tide of statism. Having tired of attempts to directly influence the political process (he did not vote after 1912), Chodorov became convinced that the only way the individualist tradition could be saved was by spreading classical liberal ideas among young people, who would one day be the opinion-shapers. Students, he believed, could be influenced and, thus, attention should be directed toward them. What the socialists have done can be undone, if there is a will for it. But, the undoing will not be accomplished by trying to destroy established institutions. It can be accomplished only by attacking minds, and not the minds of those already hardened by socialistic fixations. Individualism can be revived by implanting the ideas in the minds of the coming generations. . . . It is, in short, a fifty-year project. Unfortunately, Chodorov did not have 50 years left to see what would come of his prediction. He suffered a stroke in 1961 while teaching at Robert LeFevre’s Freedom School in Colorado. The stroke limited his activity sharply, and his output dwindled continuously until his death five years later. Yet, in many ways, his work had already been accomplished. He had done more than his part to ensure that the great American tradition of individualism would not die—at the hands of either the socialists or the growing legion of conservatives who saw little value in the ideals of classical liberalism. And he had built upon the intellectual foundations of this tradition himself, adding many keen and original insights. As libertarians continue to wage an intellectual war against the omnipotent state, they would be wise to consult Frank Chodorov’s writings. For as William F. Buckley Jr. has said, everybody is bound to benefit from exposure to his purist and dogged battle against institutionalized power, and the case he weaves for the presumptive denial to the central government of every additional BTU it asks for. 1. Cited in George H. Nash, The Conservative Intellectual Movement in America Since 1945 (New York: Basic Books, 1976), p. 380. 2. Frank Chodorov, Out of Step: The Autobiography of An Individualist (New York: Devin-Adair, 1962), p. 75. 4. Cited in Nash, pp. 17-18. 5. Charles H. Hamilton, ed., Fugitive Essays: Selected Writings of Frank Chodorov (Indianapolis: Liberty Press, 1980), p. 363. 6. Frank Chodorov, Human Events Pamphlet Number 15, Taxation is Robbery (Chicago: Human Events Associates, 1947), p. 9. 8. Cited in Nash, p. 353. 9. In a 1956 letter to National Review, Chodorov stated: As for me, I will punch anyone who calls me a conservative in the nose. I am a radical. Cited in Hamilton, p. 29. 10. In Chodorov’s mind, the Soviet Union was not a viable experiment; it would eventually implode. Thus, the United States didn’t need to wage an activist battle against it. As he liked to state: Private capitalism makes a steam engine; State capitalism makes pyramids. To him, the Soviet Union was in the process of making a number of pyramids, while neglecting the production of things that sustain a society. 11. Out of Step, p. 119. 13. ISI was renamed the Intercollegiate Studies Institute after Chodorov’s death and remains in operation to this day. 14. Out of Step, p. 248. 15. William F. Buckley Jr., Nay-Sayer to the Power-Hungry, National Review, December 4, 1962, p. 447.